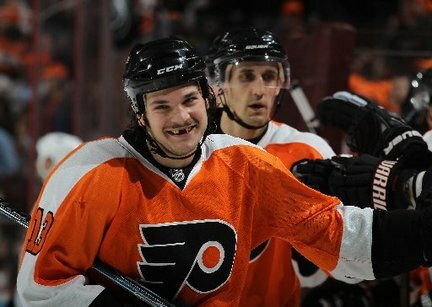 The future of Dan Carcillo in Philadelphia is up in the air once again. For the second season in a row, the truculent and maniacal forward is tapping into restricted free agency with the Flyers, looking for another contract. And for the second season in a row, general manager Paul Holmgren has to make a decision whether to extend his $1.075 million deal, or walk away. This time, it should be the latter. But it has nothing to do with his performance. The 5-1 rout against the Ottawa Senators on Monday at the Wells Fargo Center, wasn’t without casualty for the red-hot Flyers. After missing a hit in second period of the then close contest, Flyers’ forward Dan Carcillo dropped to all fours. He was helped off the ice and didn’t return to the game. The team officially called it a lower body injury, with GM Paul Holmgren saying the truculent fourth-liner would miss two weeks with a sprained MCL. No call ups are expected. However, with James van Riemsdyk filling in for injured Andreas Nodl (toe), the Flyers may have to play down a forward when the team faces the Montreal Canadiens on Tuesday. There is no word yet on if Nodl will dress. Carcillo has two points and 39 penalty minutes in 14 games this season. Since being acquired by the Flyers in 2008-09, the only consistent aspect of truculent forward Dan Carcillo has been his inability to find a niche’. And that hasn’t changed this season. Logging a time-on-ice average of just 8:25 minutes for the first four games of the year, along with being scratched entirely in against the Pittsburgh Penguins on Oct. 16, it seems that the answer to where Carcillo fits is coming to a head in Philadelphia. With a number of veteran forwards still dangling precariously in unrestricted free agency, it was guaranteed that many would be invited to try out at training camps around the league. However, few would have guessed that Bill Guerin would be among them — and that he would seek the Flyers, of all teams, for an audition. According to a press release by the organization on Tuesday, the Flyers have officially signed restricted free agent Dan Carcillo to a one-year deal worth just a shade over $1 million ($1.075). He will remain a RFA after next season. “We are happy to have Dan under contract for the 2010-11 season,” Holmgren said in the official release. In a move that will thrill as much as it bewilders the Flyer faithful — Philadelphia has opened up talks with unrestricted free agent forward Arron Asham. Asham, 32, has been with the Flyers since the 2008-09 season, but was told that he would not be retained as a UFA by the organization due to money constraints. However, according to CSN’s John Boruk, the Flyers have had a second thoughts on the gritty veteran. San Jose, Phoenix and Los Angeles have also been rumored to have interest in Asham.